Raymarine ClearCruise™ Augmented Reality is bringing enhanced on water perception to Raymarine's family of Axiom® multifunction displays with the use of its family of cameras. With ClearCruise AR, Raymarine Axiom users can make smarter decisions with navigation objects overlaid directly on Axiom's high definition video display. Compatible with the forthcoming LightHouse 3.7 OS update. AR200 Video Stabilization Module ensures accurate display of AR data while underway. 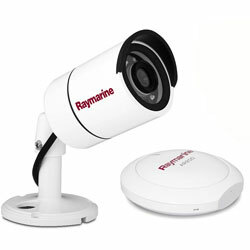 The AR200 Video Stabilization sensor works with Raymarine CAM210 (included) and CAM220 (sold separately) IP cameras and Axiom multifunction displays (sold separately). Make Smarter Decisions: See critical navigation objects overlaid on HD video. Surrounding AIS-equipped vessel traffic and charted navigation aids are clearly identified with rich graphics on a live, dynamic video image. Recognize and Respond to Nearby Marine Traffic: Color-coded labels provide instant identification, status, and risk-assessment Live AIS Targets. ClearCruise AR provides positive identification of AIS equipped vessels on the horizon. Understand Complex Navigational Situations: Major chart objects are identified for instant, heads-up recognition. ClearCruise AR technology shows you where your saved waypoints and marks are located. See Your Waypoints in the Real World: Visualize nearby marks and waypoints for easy navigation. Makes it easy to pick out the buoys marking the edges of the channel in bad weather. Note: Pan and tilt angle adjustment is a mechanical procedure, performed by physically adjusting the camera's position on its base.